Swiss Cyber Storm was an international IT security conference in the domain of cyber-attacks and defence. It featured management and tech tracks with talks from international experts about the latest findings, techniques, visions, opinions, and lessons learned. The conference also linked with the Swiss finalists team of the European Cyber Security Challenge and offered networking with national and international experts. 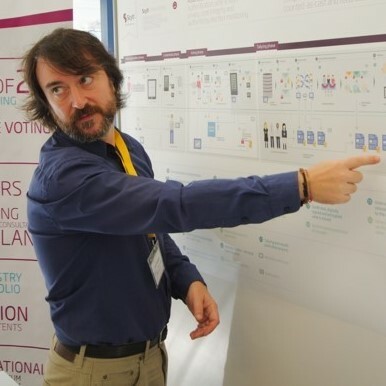 Jordi Puiggalí, Chief Security Officer, presented the Scytl and Swiss Post approach to the challenges of voter anonymization and verifiability in online voting scenarios. They showed that online voting has become a global trend and discussed how security and cryptography could be applied to the election industry. Mark Zeman was participating at the conference on behalf of FHNW. For SMESEC, the conference offered the first opportunity to reach out and inform about the project. The talk showed that SMEs are not only vulnerable to cyber threats, but that SMEs can become though leaders in the domains and use cases they serve. Also, the interaction with the present companies and cybersecurity experts initiated the dialogue on requirements for the SMESEC framework.